Rolex 1675 - Vintage no-crown guard GMT, 18K gold case, dolphin hands, available with 18kt bracelet, Nato with gold bickles, and or Leather strap with a gold Rolex buckle. With box and papers. This is an extremely collectible and rare Rolex Ref. 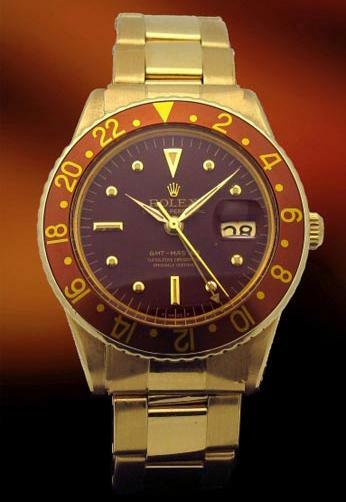 1675 “No Crown Guards”, known to collectors as the “GMT Master” which was produced from approximately 1960 until 1980. This special timepiece has a beautiful original brown dial and brown yellow gold bezel. The watch is in exceptional condition, with a mint 18k yellow gold case. The watch has been serviced and is ready to wear and enjoy. It is very difficult to find Ref. 1675 in 18k yellow gold, without crown guards. Most customers considered the GMT Master a sports watch and ordered it in stainless steel. Consequently, very few GMT’s were made in solid gold.